Yes, but flowers can be damaged by late frosts. Persimmon. Can restrict growth in other plants nearby, because many plants (including tomatoes) are sensitive to juglone, a substance present in walnut roots, leaves and wood. Walnuts should be grown in an orchard of their own, far from the vegetable garden. 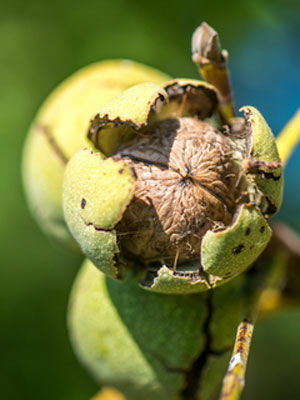 Healthy walnut trees will bear for many decades. Knock down nuts when ripe, remove the peel and dry. If pickling, harvest while it is still possible to pierce the nuts with a skewer.